I keep a micro-bead lap desk under the couch, so I can pull that out, lay down a support board, tape a sheet of paper down, and start drawing at a moment’s notice. I usually grid drawings, which makes the process much easier; I can stop for conversation, refill my wine glass, or snap a photo of my shenanigans on the couch without losing my place since I’m drawing abstract shapes in the reference photo one cube at a time. Do you grid your drawings? It’s so helpful, isn’t it!? My watercolor painting set up is small enough to move easily between the couch and the kitchen counter, so I paint there if my husband wants to surf youtube after dinner from a bar stool next to me. You can do this too, with small studies, rough still life sketches, or even abstract color swatch tests. 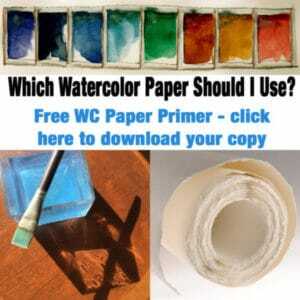 Pre-tear your watercolor paper to 8×10 or 5×7 sheets, and you can even pre-mount it in groups of four to gator board with tape so you’re ready to sketch at a moment’s notice. A little organization and pre-motor planning goes a long way in getting fast access to move those art supplies. And speaking of organization and art supplies, how do you store your finished art? Over the years, I’ve tried a number of storage options, including a large set of HON flat files gifted to me by a former employer (see below). They were solid enough to sit on, heavy enough to require moving help, and large enough to own a room. I lugged them around for years until one particular move where I just couldn’t fit them in my home. I donated the flat files to the art department of a local high school. I have an easy-peasy filing system for small work now, and my larger, unframed work goes into 18×24, vertical cardboard file folders that can be tucked into the back of a closet, or behind a door. Do you know about these (see below)? Back in the day, I was gifted this excellent five-drawer set of flat files (on the left). My friend BJK built me a groovy wood platform to raise it up as a work surface in my studio. Those flat files were awesome, and heavy and cumbersome. I use these cardboard file folders in the 18×24 format to store unframed art, as well as full sheets of paper. I’ve kept my printmaking paper in one of them for years, with post-it notes arranged like tabs to separate different manufacturer’s and weights of paper. The folders have done a great job of protecting my paper and art from dog ears and dents. I use these clips to hold them closed, and tuck the folders in the back of a closet or under the bed. I squeeze all storage possibilities from the closet in my studio with caddies like this one by closetmaid in the photo above. In my previous studio, a closetmaid shelf unit with a bag of wooden clothespins served as a drying rack for printmaking (see below). I don’t currently have a drying rack for prints, but I’m marinating on a solution that I’ll share when I get it figured out and assembled. I also use two hanging cloth shoe-boxes (like this one) to hold carving tools, boxes of printer ink, video camera equipment – like the bulbs and the umbrella for my lights in the watercolor at the top of this post. The front-load opening of the shoe hangers are perfect for boxes of business cards, staplers, zip-locked tubes of paint, framing hardware, shipping supplies and the like. A vintage ceramic owl planter and a hand-thrown clay pot made by a friend hold pencils and brushes in my studio. 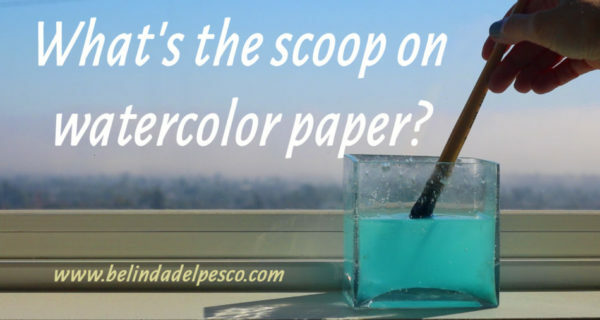 What do you use to store small and large scale flat art, paper and various artist supplies? Being an artist is messy, and the supplies can take over a room (or a whole house, depending on your media). Putting things away and clearing your main work surface for more creative time can make a big difference in productivity. How do you get your space organized? Leave your tips and tricks in the comments, and lets get ourselves arranged and ready for summertime art making. P.S. You can subscribe to get each new post via email right here (free). This was amazingly helpful! Thanks! Thanks for the shoutout! How well I remember those cabinets. I would never have kept that beast without the raised stand, so thank you again for such sturdy tall-ifying assistance! I love your storage ideas, especially the large files. That’s the first thing on my list to get my art closet organized! Thanks for so many good ideas to help on the road to creativity! Great heaps of luck in your pursuit of art-readiness through a little clean sweep! I am consistently moved by the Belinda blog — your generosity and good spirit! And by your well-developed eye for the Beautiful and True. Thanks for posting. Great idea for vertical storage of artwork and paper. It’s always hard to figure out where to store delicate artwork, like pastels. I use tracing paper pads of varying sizes and store artwork between the sheets. The sides are closed with binder clips so everything stays in place. It can then be stored vertically or flat. I’m fortunate to have a dedicated art/sewing room and places to store all my supplies, but we all seem to start with a spare bedroom. I always enjoy your blog. Thanks for keeping us inspired. Hi Mickey, Storing pastels between the still attached sheets in pads of tracing paper with clips is BRILLIANT! I don’t work in pastel too often, but once a piece is finished, it’ll go in a tracing paper pad from now on. Thank YOU! Thank you for the suggested lap top pillow. I have a room I escape to also and this will work wonderfully. Hi Debbie, I *love* using the lap desk for drawing. And your Escape Room sounds delightful. I hope it helps you create more frequently.